Complications following facelift surgery or rhytidectomy can be devastating, particularly because of the elective nature of this procedure. As with all surgical procedures, complication prevention is paramount. Proper patient selection, mastery of pertinent anatomy, attention to meticulous surgical technique, and conscientious postoperative care are all important factors in preventing facelift surgery complications. 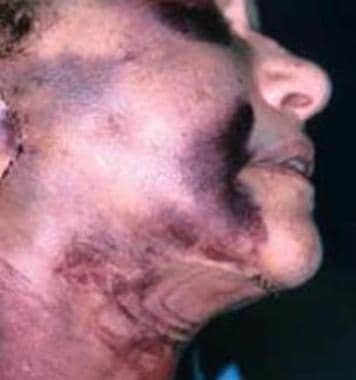 Complications include (1) hematoma, (2) nerve injuries, (3) infection, (4) skin flap necrosis, (5) hypertrophic scarring, (6) alopecia and hairline/earlobe deformities, and (7) parotid gland pseudocyst. So-called minimally invasive procedures such as barbed suture lifting have emerged. With these and other recent minimally invasive procedures, such as thread lifts, new complications have been reported, including Stensen duct laceration and suture visibility and extrusion. An example of facelift surgery complications can be seen in the image below. Complications of facelift surgery. Major hematoma diagnosed within 12 hours of surgery. Careful patient selection is paramount in preventing complications from facelift surgery or rhytidectomy. A comprehensive history often exposes potential risk factors for future complications. Some relative contraindications for rhytidectomy include (1) smoking and/or alcohol abuse; (2) collagen vascular disorders; (3) poor nutritional status; (4) anticoagulation bleeding disorder; (5) use of Accutane, high-dose steroids, or immunosuppressants; and (6) poor medical condition (eg, uncontrolled hypertension, poorly controlled diabetes, significant chronic airway disease [CAD], significant chronic obstructive pulmonary disease [COPD]). Hematoma is the most common complication after facelift surgery or rhytidectomy. Risk is higher in men (7-9%) than in women (1-3%). Other factors that have been associated with increased risk of hematoma include anterior platysmaplasty, high systolic blood pressure, aspirin or NSAID intake, and smoking. Permanent motor nerve paralysis occurs at a rate of 0.5-2.6%. The marginal branch most commonly is injured, followed by frontal and buccal branches. Pseudoparalysis of the marginal mandibular nerve due to cervical branch injury can be distinguished from true marginal mandibular injury by the fact that the patient will be able to evert the lower lip because of a functioning mentalis muscle. The prevalence of cervical branch injury in SMAS facelifts is reported at 1.7%. Sensory nerve injuries are more common, with great auricular nerve injury reported in up to 7% of cases. Severe infections (requiring intravenous antibiotics) are rare, affecting less than 0.2% of rhytidectomy patients. Reported prevalence of alopecia is 0.2-1.8%. Other complications are even rarer, and data are not available regarding prevalence of these complications. Predisposing factors for hematoma include male gender, poorly controlled hypertension, and occult aspirin or nonsteroidal anti-inflammatory agent use. (Many postulate that hematomas are more common in men because of the greater vascularity of flaps secondary to hair follicles of the beard and its associated adnexal glands). Intraoperative factors include extensive skin undermining, use of general inhalational anesthesia, and failure to attain adequate hemostasis. Postoperative factors include poor control of nausea/vomiting accompanied by excessive retching or coughing. Transient motor nerve paralysis is more common and may be due to local anesthetic effect, excessive traction of the submucosal aponeurotic system (SMAS), infection, or hematoma. Permanent nerve injury can be prevented by detailed understanding of the anatomy of facial danger zones (see the images below). Nerve injury may result from inadvertent clamping, tying, or electrocauterization of the nerve during an attempt to control brisk hemostasis. Complications of facelift surgery. Course of the frontal branch of the facial nerve. Complications of facelift surgery. Layers of the temporal fossa and the scalp. The facial nerve runs on the undersurface of the temporoparietal fascia layer. This condition is more common in smokers and in patients with longer and thinner flaps. Unrecognized hematoma may lead to skin flap necrosis. Alopecia may be caused by excessive tension on suture lines and is often transient because of the shock to the hair follicles. Recovery usually occurs within 3 months. Hairline distortion results from poor incision planning and improper redraping of the skin flap. Earlobe distortion results from poor incision placement, inaccurate reapproximation of the earlobe to the redraped skin flap, or excessive tension on the skin closure. This condition may occur after trauma to the parotid gland when raising the SMAS flap. Patients with major hematoma (see the image below) present with pain, agitation, hypertension, neck/facial swelling, buccal mucosa ecchymosis, and skin ecchymosis. Major hematoma occurs within 12 hours postoperatively. Pain is the sine qua non of major hematoma. Patients with minor hematoma present with localized swelling or bogginess. The condition occurs within 1-14 postoperative days (POD). Hematoma may predispose patients to infection or skin flap necrosis if not treated. The physician must distinguish transient paralysis from permanent paralysis. Transient paralysis due to local anesthetic effect or underlying hematoma formation must be excluded. Cases of painful neuroma formation following inadvertent transection of the great auricular nerve have been reported. Patients with infection may present with fever, chills, facial swelling, erythema, pain, fluctuance, and drainage. Cyanosis of the skin precedes necrosis and is potentially reversible (see the image below). Patients may present with underlying hematoma or infection. Complications of facelift surgery. 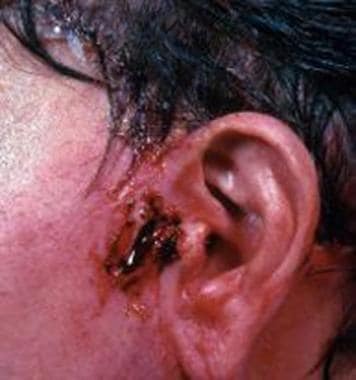 Full-thickness skin flap necrosis in the preauricular region. This condition is usually detected during POD 3-10 and is characterized by recurrent facial swelling following repeated aspiration of clear fluid. A parotid gland pseudocyst may be the cause of a persistent seroma overlying the angle of the mandible following rhytidectomy. The frontal branch of the facial nerve (see the first image below) exits the parotid gland and courses deep to the SMAS layer as it approaches the zygomatic arch. The branch then enters the temporal fossa by crossing superficially over the middle portion of the zygomatic arch. It travels in the temporoparietal fascia layer and then exits the temporal fossa to course along the deep aspect of the frontalis muscle. Injury occurs when dissecting too superficially in the temporal region. 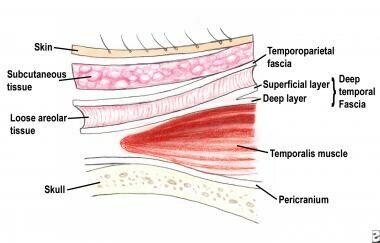 The correct dissection plane in the temporal region lies below the temporoparietal fascia and directly above the superficial layer of the deep temporal fascia (see the second image below). The marginal branch of the facial nerve exits the parotid gland and courses deep to the SMAS layer as it approaches the angle of the mandible. The branch then courses 2-3 cm below the lower border of the mandible, deep to the platysma and superficial to the facial artery and vein, before heading more superiorly toward the oral commissure. Injury often occurs when attempting to obtain hemostasis from inadvertent injury to the facial artery or vein. This branch exits the parotid gland and courses deep to the SMAS layer. Injury occurs when dissecting anterior to the parotid (eg, as in deep plane facelifts). Direct visualization of the nerve branch is essential to avoid injury when beyond the anterior border of the parotid gland. The great auricular nerve courses deep to the platysma, along the sternocleidomastoid muscle fascia, after exiting from the Erb point. The nerve courses posterior and parallel to the external jugular vein. Injury to the nerve often occurs when attempting to obtain hemostasis from inadvertent injury to the external jugular vein. No additional laboratory or radiological workup is necessary for most of the above complications. Diagnoses of parotid gland pseudocyst can be confirmed by checking amylase levels of the aspirate. Major hematomas are a true emergency. Immediate surgical drainage is necessary to avoid flap necrosis. Often no discrete bleeding vessel is identified during surgical exploration. Direct evacuation of minor hematomas is preferred if the hematoma is detected early and is easily reachable through an existing incision. Otherwise, minor hematomas may be treated with serial needle aspirations and pressure dressing. Antibiotic prophylaxis is suggested. If a motor nerve is knowingly transected, immediate microscopic neurorrhaphy is indicated. If nerve injury is noted postoperatively, institute expectant management. Eliminate anesthetic effect. Transient paralysis is more likely than permanent paralysis. Major infections requiring intravenous antibiotics are rare. The predominant organisms causing infection are staphylococci. Patients with minor hematomas may warrant oral antibiotic prophylaxis. Treat partial-thickness injury with moist surgical bandage, occlusive ointments, or both. These injuries may result in normal healing, hypertrophic scar formation, or abnormal pigmentation. Treat full-thickness injury with conservative debridement and healing by secondary intention. This condition may be treated with intralesional corticosteroid injections or silicone topical therapy (eg, Cica-Care, Kelo-cote gel). Perform scar revision only after complete wound maturation. Transient traumatic alopecia is likely to normalize in 3 months. Permanent alopecia may be corrected with local flaps or micrografts and minigrafts. Observe earlobe distortion for spontaneous improvement. Surgical correction with local advancement flaps may be used for persistent deformity. Treat this condition with frequent needle aspirations and suction drain insertion. Ischemic changes of the skin flap are reversible, and skin flap necrosis and scarring are avoidable, if major hematoma is detected early. Chance of infection increases upon reexploration of wounds. Minor hematoma usually resolves without sequelae after evacuation or after serial aspiration. Slight soft tissue contour irregularity may result, however. Intraoperative neurorrhaphy improves facial paralysis to House-Brackman Grade IV status. For postoperatively diagnosed paralysis, rule out local anesthetic effect. If paralysis remains, manage initially as neurapraxia. Monitor with serial examinations and electrical testing. Adjunctive measures to assure corneal protection include lubrication and gold weight. Great auricular nerve injury is usually permanent, but the affected sensory area typically decreases in size over time. Painful neuromas may result with transection. Most infections resolve without sequelae if detected and treated early. Some soft tissue contour deformity may result if infection is severe or undetected. Healing by secondary intention often results in a satisfactory scar, although hypertrophic scarring may result. This problem often resolves without sequelae within 1-3 weeks upon repeated aspiration or drain insertion. Rachel JD, Lack EB, Larson B. Incidence of Complications and Early Recurrence in 29 Patients After Facial Rejuvenation with Barbed Suture Lifting. Dermatol Surg. 2010 Jan 19. [Medline]. Rohrich RJ, Stuzin JM, Ramanadham S, Costa C, Dauwe PB. The Modern Male Rhytidectomy: Lessons Learned. Plast Reconstr Surg. 2017 Feb. 139 (2):295-307. [Medline]. Maricevich MA, Adair MJ, Maricevich RL, et al. Facelift complications related to median and peak blood pressure evaluation. Aesthetic Plast Surg. 2014 Aug. 38(4):641-7. [Medline]. Ramanadham SR, Mapula S, Costa C, Narasimhan K, Coleman JE, Rohrich RJ. Evolution of hypertension management in face lifting in 1089 patients: optimizing safety and outcomes. Plast Reconstr Surg. 2015 Apr. 135 (4):1037-43. [Medline]. Kridel RW, Liu ES. Techniques for creating inconspicuous face-lift scars. Archives of Facial Plastic Surgery. 2003. 5:325-333. Sharma VS, Stephens RE, Wright BW, Surek CC. What Is the Lobular Branch of the Great Auricular Nerve? Anatomical Description and Significance in Rhytidectomy. Plast Reconstr Surg. 2017 Feb. 139 (2):371e-8e. [Medline]. Kandinov A, Mutchnick S, Nangia V, et al. Analysis of Factors Associated With Rhytidectomy Malpractice Litigation Cases. JAMA Facial Plast Surg. 2017 Jul 1. 19 (4):255-9. [Medline]. Complications of facelift surgery. Same patient after healing by secondary intention.